See in Glossary complexity, or help you integrate content available externally. See in Glossary that has one. Unity then plays the Video on that Texture at run time. 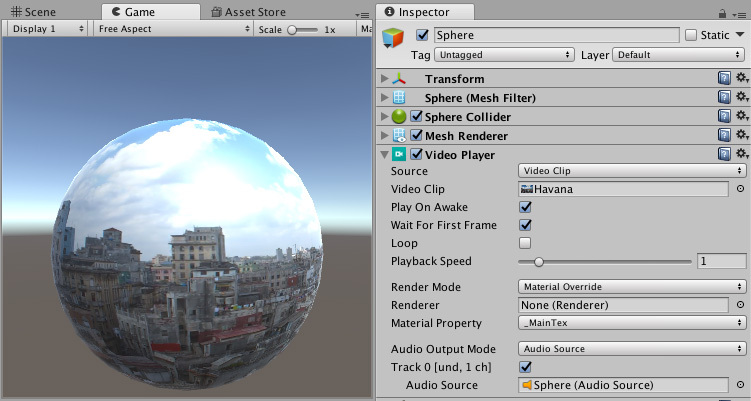 A Video Player component (shown in the Inspector window with a Video Clip assigned, right) attached to a spherical GameObject (shown in the Game view, left). Unity’s video features include the hardware-accelerated and software decoding of Video files, transparency support, multiple audio tracks, and network streaming. See in Glossary, introduced in Unity 5.6, supersede the earlier Movie Textures feature.